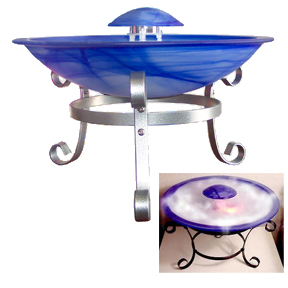 A Table Top Mist Fountain with Scrolling Iron Base. This is a table top version of our most popular model, the regular Iron Mist. The regular model has only a floor stand, and this one has only the table stand. If you want both stands, check out our Deluxe Iron Mist Fountain. It is a combo of both, and comes with both a floor stand and a table stand. This model comes with an elegant iron base and is a convenient size that will fit almost anywhere. Use this indoor water feature to create a relaxing mood, and improve the air quality in any room of your home. It functions as a humidifier, air purifier, fragrance oil diffuser and fog generator in one. The misting device generates negative ions that are released in the form of a swirling cloud of natural mist. It has 12 LED lights that can be set to stay one color or rotate through a spectrum of 16 color combinations. The Iron Mist comes equipped with a low-water shut-off sensor that automatically turns the fountain off if the water level is too low. All you need is water to produce mist. There is no heat, dry ice, or chemicals necessary. The Iron Mist Table fountain comes with your choice of colored bowls. Choose the best color to fit your decor. This fountain is available with a glass bowl in the following colors: Blue, White, Green, Pink and Yellow. The fountain pictured above is in the most popular color, blue. It is designed to improve the air quality in your home and decorate it at the same time. It generates fog and mist by utilizing electrical oscillation technology. The ceramic disc in the misting unit vibrates under a high frequency to generate negative ions and a natural fog on the top of the water. There are no chemicals or dry ice involved. This unique technology allows you to generate endless amounts of mist without anything but water. This fountain not only looks good, with it's curving iron base and colorful light display, but it is also beneficial to your health and well being too. The combination of mist, fog, running water and colored light created by this fountain is not only pleasing to the senses, but is also good for your health. It is a natural humidifier that can help alleviate breathing problems for those suffering from asthma or other respiratory problems, as well as improve the well being of your house plants because they thrive in a more humid climate. This fountain also purifies and cleans the air in your home by releasing negative ions into the atmosphere. Add just a few drops of aromatherapy oils to your fountain and it becomes a great insence diffuser too. With 12 color changing LED lights, that you control, this fountain will surely enhance any room you put it in. Order Yours Today! Includes a misting device with color rotating LED lights, sturdy iron stand, and a colored glass bowl. Comes with table stand only. Order Yours Today! Great for humidifying any room, especially if you have a wood burning firplace. Cleans cooking odors from the air. They have greatly improved my asthma and I sleep better at night. Great for every room of the house. I had my Iron Mist Table Packed away while moving. It was about a year and now I forgot how much water to put in it. I know it cuts off with too little, but how much is too much. Can I cover the lights or not? Thank you. Oh yeah. Definitely cover the lights. You can basically fill the bowl. The black thing sticking up from the top of the mister is a low water sensor, so it won't work unless there is enough water in the bowl. It's difficult to have too much water, but if it does get submerged to far, it will reduce mist, and then eliminate it in extreme situations. No amount of water will be enough to cause long term problems or damage. You can feed the cord through the rubber stopper to reduce the length inside the bowl. For further assistance, please give us a call and someone would be happy to walk you through it.